So, as someone who loved Super Mario 64 and especially Super Mario Sunshine and thought Super Mario Galaxy was too linear, Super Mario Odyssey is like a dream come true for me. I was literally screaming during the original trailer, I don't think I've ever been so excited from a video game trailer before. Also, as someone who actually likes the Mario lore(and is still bitter over Miyamoto's retcon of the Koopalings) I'm absolutely bonkers to see Pauline again. If that wasn't awesome enough, she's been revealed as the Mayor of the New Donk City world AND she even has a song! This is the first song with lyrics in a Mario game, not counting spin-offs like Wario Ware's Mona Pizza. It's so cool to see Nintendo embrace Mario's story for a change. Absolutely love everything that's been revealed so far. I am a little concerned about about the removal of extra lives, but that's probably because I'm stuck in the past. People have been questioning the relevancy of lives in modern games for a long time now so I'm sure many will enjoy this change. Motion controls are back and but I'm fine with them since they're optional thanks to the Pro Controller. 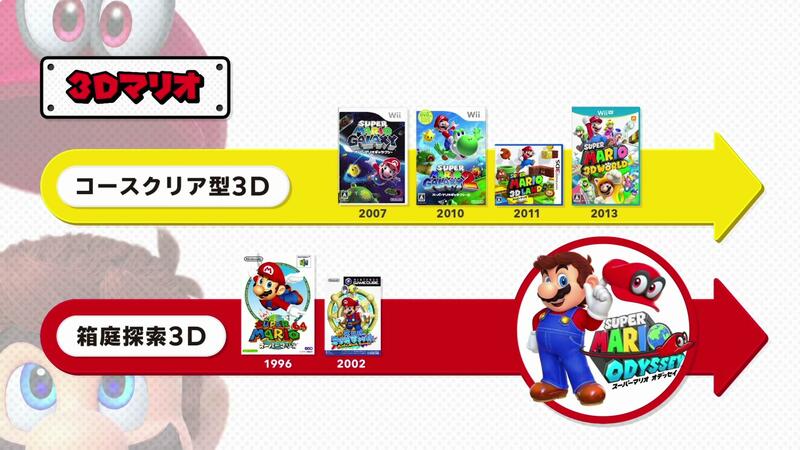 Mario has an excellent track record for 3D games. Odyssey looks fantastic, Galaxy 1 and 2 were fantastic, and 3D Land and 3D World were both great as well. Cool to see Pauline finally integrated into the main Super Mario series. It makes sense as the game seems to take place in a more "realistic" world. I'm hopeful that Donkey Kong will at least get a cameo. Also, the new line of Mario Odyssey amiibo do look pretty cool. It's so weird that's it has taken them almost 8 years from the time of Mario Galaxy 2 to release a "real" Mario game. That's longer than the amount of time between when the original Mario Bros. (not Super Mario Bros.) coming out in 1983 in Japan and when Super Mario World came out on SNES in 1990. Why did it need to take so long? Imagine getting 0 "real" Mario games during that entire time. Whole generations of video game players are forgetting why they should care about a new Mario game, and understandably so. Supposedly this is the first "sandbox" styled Super Mario game since Sunshine on the Gamecube. I guess the Galaxy series is considered to be a more linear interpretation of the genre. Personally, I consider Super Mario 3D World as "real" a Mario game as anything else. It and Super Mario Maker are my favorite Wii U games. I think "Super Mario" and "Super Mario Bros" are two distinct series. I'd start the "Super Mario" series with Mario 64 and Odyssey being the most recent. The "Super Mario Bros" series goes from SMB1-3, USA, World, New Super Mario Bros 1-Wii-2-U, and Super Mario 3D Land and 3D World. I guess the Galaxy series is considered to be a more linear interpretation of the genre. It's been a long, long time since I've played it, but I seem to remember being able to choose different galaxies to visit at will? No different than SMB3 or Super Mario World in the "path" you can choose, if memory serves. Galaxy 2 definitely remains the last "core" game... the rest seem like strange side things, experiments or half games. So does every kingdom have a store for Mario to buy outfits? So far I've seen that the sand and woodland kingdoms both do. Not a super fan of that aspect. Otherwise looks fun and throwing his hat is cool. I don't agree perfectly agree with it since the series evolved through out each incarnation. Galaxy still felt like the first 3D games even if the levels were more linear. Galaxy 2 made the games even more linear however and by the time 3D world happened it was nothing like 64. I love 3D open world platformers since I grew up with them and was saddened when the Wii U only got 3D world. Odyssey looked awesome and return to norm but looking at some of the footage, there's definitely still tons of SM3D World influences in the game. I'm glad there's more focus on the 3D open world but I don't even understand why they did that whole explanation of the two different type of Super Mario 3D games since they've all been an evolution. As far as the game, I love that Pauline is back and that New Donk City is basically the "real" world, I wasn't crazy about it at first but they explained it with lore that this is the world of Donkey Kong and Mario Bros. games before Mario goes to the Mushroom Kingdom. Yeah, things are not very mario like and strange, but that's the whole point of the game, to have something different from what we're used to, it's only one game. I hope we get Odyssey 2 like with the Galaxy games. Whole generations of video game players are forgetting why they should care about a new Mario game, and understandably so. The "new" SMB series are considered "mainline" games so the Mario is a fun platformer has always been there and there's more than enough Mario spin-offs for him to have around 2 games per year so he's relevant. Thanks for sharing that photo, sdp! Yeah, I guess that's the way Nintendo is going to consider things now. I wonder if they consider all the 2D "New Super Mario Bros" games to be in the same line too. I actually prefer the linear mission-styled games over the formula of Mario 64, but I do applaud Nintendo's efforts to change things up from time to time. Guys, it's not that complicated. Super Mario 64, Super Mario Sunshine, Galaxy, Galaxy 2, 3D Land, 3D World...and now Mario Odyssey. All the classic NES/SNES/Gameboy games, and the New Super Mario Bros. series. Besides that Yoshi has an entire series to himself of 2D platformers, Super Princess Peach, and the platforming segments in the various Mario RPG's. You've simply not been keeping up, old man. New Super Mario Bros U, Super Mario 3D Land, Super Mario 3D World, etc. Plenty of Mario going around. But this one looks to top them all & I am hyped! Those don't really seem like they're part of the "main" series of Mario games any more than, like, Paper Mario or Mario RPG. I mean, if you numbered out all the games, Super Mario Bros. is SMB1 ("Mario Bros." would be #0) and Super Mario Odyssey would be like SMB10, and those games you mention wouldn't get a numeral. That last clip looked like Grand Theft Auto at the beginning. The only question is, how much carnage will you be able to cause? Well officially Nintendo considers the "New" SMB games as mainline games, beginning with the DS one and yes they include 3D Land as well even if they're portable. For the 25th anniversary they didn't consider the other portable games on Game Boy as mainline games but since the 30th anniversary even the Game Boy games Super Mario Land 1 and 2 are considered mainline games. Sorry Super Mario World 2: Yoshi's Island and Super Mario Land 3: Wario Land aren't and are part of their own series. Mario Bros. isn't considered part of the franchise, I guess since it's not "Super" but now that Odyssey is basically referencing Donkey Kong I guess Mario Bros. is back in "canon". I don't understand why people act like 3D Land and 3D World aren't real or even mainline Mario games. They're what Mario 64 should have been. Anyway, this game looks amazing but I can't help but feel like they just copied exactly what they did with Breath of the Wild. It's like breaking the conventions to Nintendo meant dressing the protagonist up in different clothes and collecting korok seeds or in Mario's case, those moon thingies. Also, I hope Donkey Kong appears in this game. They got to have a part in there where DK kidnaps Pauline and climbs up a really tall building like King Kong and throws barrels at you as you're making your way up the building. It's got to happen. 3D Land made sense that it wouldn't be considered since in the past the "Land" games were not considered main games, same reason with the original "New" SMB but now that Nintendo considers them as "real" as the console ones who are we to argue. I don't think people didn't consider 3D World as a mainline game, they just wanted a "real" 3D game and this felt like prettier version of 3D Land rushed out to save the Wii U since it was faster to make this type of game than a "real" 3D game. Now we know that Nintendo just thought it was a better way to represent Mario in 3D and not because they didn't want to have a "real" 3D game. I'm in the camp that prefers "real" 3D Mario games but whatever as long as they keep giving us both types of games I won't complain. Anywho it would be a huge mistake not to have Donkey Kong appear in the game, it would be so refreshing and awesome to see Donkey Kong in a a "mainline" Mario game. Who knows though since we already have Bowser and the evil hat but here's hoping. I would also like to see Wario, Daisy and other forgotten characters stuck in spin-off games in a "mainline" game. Hell Waluigi has never been in any Mario series like Paper/&Luigi/etc outside of quirky/sports spin-offs, he deserves to be the villain in a game. Why can't Wario be a villain again in a spin-off series like Mario & Luigi? Super Mario Land 1 and 2 were considered main Mario platformers on one of the last Mario promotional sheets Nintendo made. The only reason they seem weird is Miyamoto didn't have much to do with them. Besides that, they introduce important characters. Mario Land introduces Daisy, and Mario Land 2 introduces Wario...both characters who became permanent Mario characters. Pauline was re-invented back in 2006 with Mario Vs. DK: March of the Mini's on DS, and Nintendo has kept this design ever since. Strange that she's never been in the Mario Kart games. Actually, her current design debuted in 1994 with the Game Boy remake. I've said it before, but Nintendo has a huge cast of memorable Mario characters that would be great for Mario Kart...but instead we get things like Random Dry Bones, Baby Daisy and Gold Peach.